In Con ’Em If You Can, the player — mentored by con artist Connor — uses a variety of fraud tactics to convince people to invest their money in bogus projects. By having players be fraudsters, the game hopes to make them more aware of persuasion tactics and more vigilant against fraud. The player starts at the Fast and Furriest Dog Track, the first of five locations in the Shady Acres map, where they meet people — or “targets” — susceptible to falling for their con. Each target is vulnerable to specific persuasion tactics: phantom riches, source credibility, scarcity, social consensus, and reciprocity. But they are also resistant to them. Their resistance to these tactics is represented by a number between 1 and 11. The player must inflict “damage” and bring the target’s resistance to 0 using their various persuasion tactics. 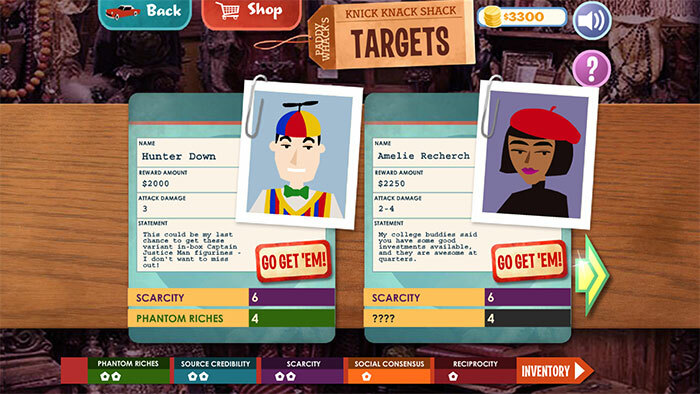 Succeed, and you will collect the target’s money, plus some bonus cash. Fail to convince them after having used all your tactics, and the target will attack your credibility (their attack damage varies from target to target). If you still have some credibility left, you’ll have one last chance to convince them and get their money. Since the Fraud Fighting Agency (FFA) is hot on their trail, the player can’t linger in one place for too long. Moving to new locations, the player will need more effective tools as targets will become harder to fool. With the money they’ve “earned,” the player will want to visit the shop and buy new, more effective persuasion tools for each type of tactic. They can also purchase “charms” — a winning smile or a firm handshake, for example — that can boost the damage of one tactic. 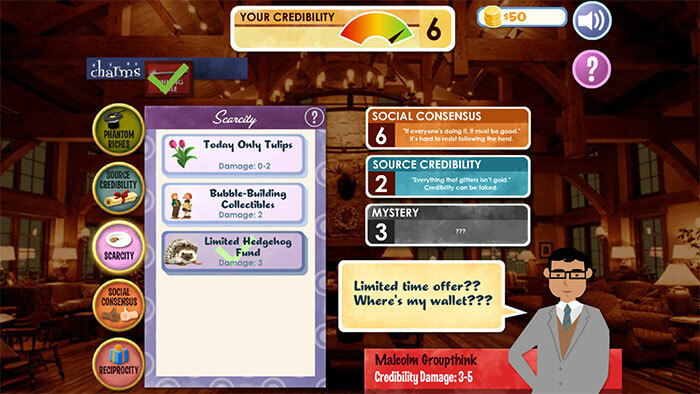 However, if the game successfully presents types of persuasion tactics, the gameplay itself doesn’t always support the goal of helping players identify a fraudster’s tools. When the player selects a tool that matches their target’s vulnerability, they don’t actually get an idea of the dialogue that takes place between a con artist and their victim. With tools related to building source credibility (“Fake Advisor’s Certificate,” “Slick Portfolio” …) or social consensus (“Family Ties,” “Convenient Shared History” …), the labels speak for themselves, but other tools, while humorous, don’t make it explicit how that persuasion tactic can play out in real life or what it means (like “Fancy Investment Seminar,” linked to reciprocity, or “Bubble-Building Collectibles,” linked to scarcity). Furthermore, clicking on the tools to deal damage doesn’t require the player to reflect on fraudulent tactics: They might be more concerned about winning the game. 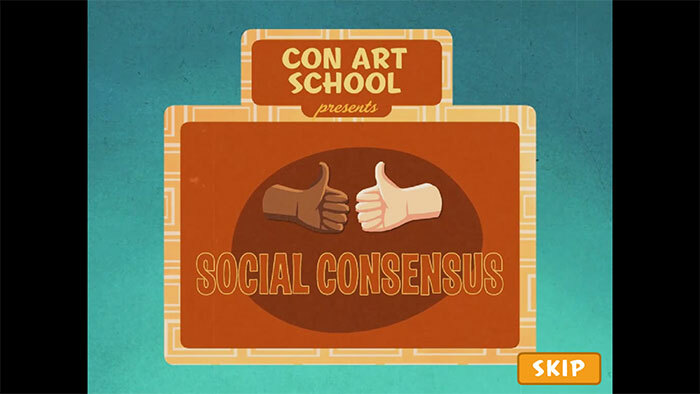 Con ’Em If You Can presents relevant information on persuasion tactics used by both con artists and legitimate businesses and could be integrated in high school classes covering economics and financial literacy. As students risk being approached both online and in person by fraudsters (and marketers), they should be made aware of how they are vulnerable to these persuasion tactics. In this sense, the game succeeds in identifying various red flags. I appreciate that the explanation videos mentioned above are available online, along with a tip sheet. Con ’Em If You Can can be played for free and is available on Google Play and the App Store. The download, however, was broken on my Apple devices (iPhone and iPad), and I was unable to make it work (I borrowed an Android phone). In short, unless you’re using Android devices, it’s hard to access the game. That being said, an Educator’s Guide, available online, provides a sample lesson plan and a short quiz. The “Reflection” section can also help teachers guide their students: Have they witnessed those tactics before? Why do they think they work? Which tactic are they most susceptible to falling for? With these resources, Con ’Em If You Can can be relevant in the classroom. Con ’Em If You Can uses lighthearted humor to cover five types of persuasion tactics used in financial fraud, and the videos produced for the game offer good, simplified explanations of these fraud tactics. The gameplay is simple and fun, but the game should be part of a larger lesson plan in order to get students to reflect on their vulnerability to persuasion tactics.